Hey guys – it’s National S’mores Day! And I had every intention of having this post ready to go and posted for you yesterday so that you had time to make it for the occasion. But guess what? I played with the dog outside all day and then I fell asleep. Soooo… yeah. Sorry about that. But better later than never, right? Right. I love s’mores. It’s not often that I have them since I don’t have a fire pit to roast the marshmallows over, but I find ways to turn most anything into a variation on the classic s’more. Graham crackers, chocolate, and marshmallows. It’s so simple (and messy), but it’s so good and it just screams summer. So what did I do this time? Turn it into ice cream. And I will tell you right now that you don’t want to substitute the Fluff for mini marshmallows. Why, you ask? Because the marshmallows could get frozen and then it’s like chewing on little white rocks. And that’s not fun for anyone. And why do I specify Marshmallow Fluff? Because it was invented in Massachusetts, and I live in Massachusetts, and if I didn’t it would be pretty much be blasphemous. Could you make your own version of Fluff? Of course you could. If they don’t sell Fluff where you live, or you just want the peace of mind that it’s homemade, go nuts. Try this recipe over at Spend With Pennies. Why do I keep asking questions and answering them myself? I really don’t know, but I promise I’m done. The one thing I wish I had done a little bit differently is to have added just one more graham cracker. I used three, but in the recipe below I note that you can use three or four, according to your tastes. If you don’t have mini chocolate chips on hand, you can chop up a chocolate bar or use chocolate chunks. You can do whatever you want as long as you promise me that you won’t forget the chocolate. The chocolate is very important. Maybe even top it will some chocolate syrup, or that magical chocolate shell that hardens when you pour it over ice cream. Mmmm. Excuse me – I have some ice cream in the freezer I need to go consume so it doesn’t go to waste. Omnomnomnom. A cold and creamy spin on an American summer classic! Smooth vanilla ice cream with chunks of chocolate and graham cracker is sure to cool you down and bring a smile to your face. No campfire required! 1) In a large mixing bowl, combine heavy cream, sugar, half and half and vanilla. Mix until ingredients are well-combined and smooth. 2) Add in Fluff with a wooden spoon and stir until well combined. 3) Place bowl in the fridge for 30 minutes to an hour to let it thoroughly chill. 4) Place graham crackers in a heavy-duty plastic baggie and crush with a rolling pin. Having bigger chunks isn’t bad, it doesn’t need to be crushed to a fine powder. Add chocolate chips to the bag and shake it up to mix them together. 5) Pour batter into ice cream maker and prepare according to manufacturers directions (usually 25-30 minutes of churning). During the last 5 minutes, add in your chocolate chips and graham cracker mixture. 6) Store in freezer-safe container and freeze for a couple hours if you want it to be soft-serve texture (or overnight, if you want to eat it after it’s hardened). 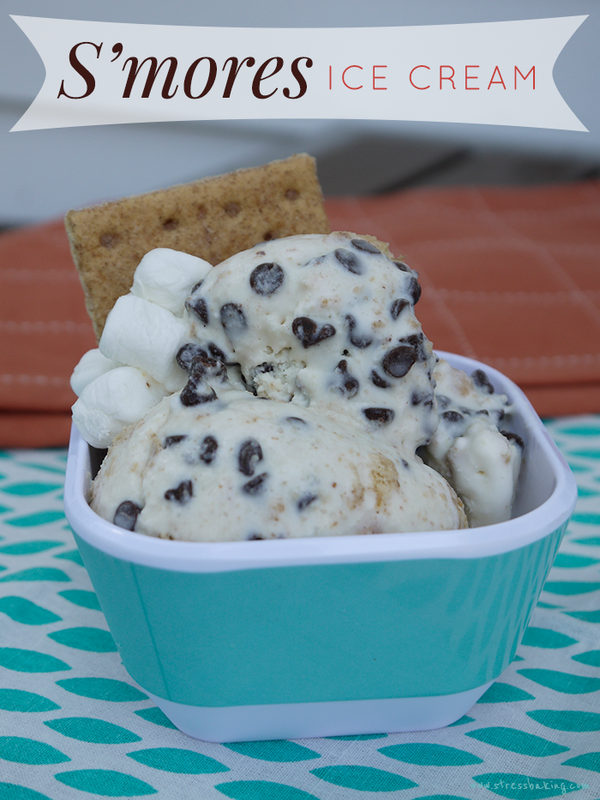 Scoop it into a bowl, plop it on top of a cone, sprinkle it with some mini marshmallows or whipped cream and enjoy! Oooh this is my kind of ice cream! Looks amazing!